During World War II the Harvard was the advanced trainer pilots had to master before progressing onto frontline fighters. It served this role in the Commonwealth and United States Forces, thereby becoming one of the unsung heroes of this era. ZK-TVI (civil registration) or NZ 1057 (RNZAF designation) is one of the 202 American built Harvard’s delivered to the Royal New Zealand Air Force (RNZAF) in the 1940s. 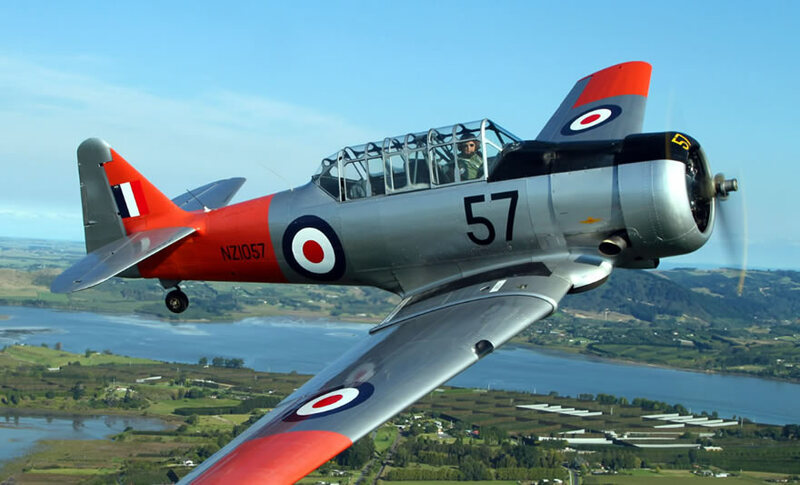 The RNZAF disposed of the Harvard’s in the mid 1970s and TVI suffered the ignominy of becoming a playground amusement before it was recovered and subsequently rebuilt from the wheels up in to flying condition in 1998. NZ 1057 is presented in its 1950’s RNZAF livery, the colours it ‘wore’ when it last flew in military service. Warbirds adventure rides offers you the opportunity to fly in this iconic aircraft, perhaps as your granddad did 70 years ago. You get to experience the noise, the feel, the smells of aviation from another generation, flying without computers or microprocessors, just the skills of the pilot. You can enjoy one of our standard flight routes, or we will tailor a flight profile to your requirements, either way, we guarantee an experience you will never forget.